How many streets of value you can get? Look ahead before making that flop value bet on a dry board. Postflop poker: A cash game hand showing value that can be had by looking ahead to future streets. Hello, Poker Friends! This week, we are going to take a look at a key skill you should continually work on improving in your game — looking ahead to future streets. Hero (Matt) is at a $2/$5 table at the Borgata. The Borgata Summer Open is in full swing, so the table is full of loose-passive tournament knockouts. The Main Villain for this hand is in middle position and he just joined the table within the last orbit. He is in his mid-20s and has the "grinder outfit" of hoodie, earbuds and a backpack. Hero suspects that Villain came from the tournament since Hero does not recognize him as a Borgata cash game reg. Hero is under the gun and looks down to find . Hero opens to $25 and gets three callers — two from middle position including the Villain, and the small blind. If you've had a chance to listen to our podcast lately, we've discussed how we've made a minor adjustment to our preflop opening sizing. In the summer in Atlantic City, the sun comes out and so do the loose-passive recreational players. In this environment, opening from early position can often turn into a nightmare. 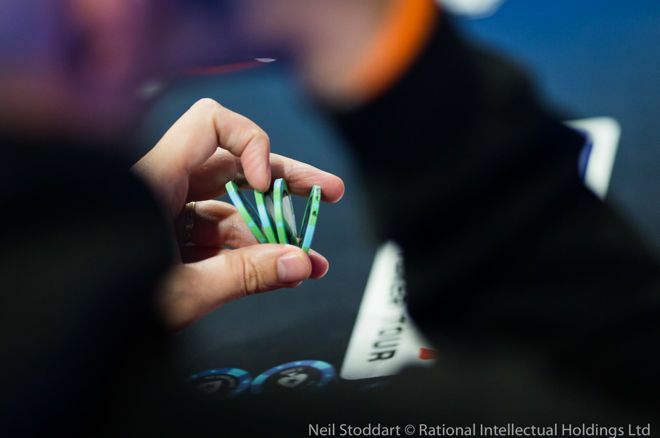 There are very few hands in a UTG opening range which want to play in a six- or seven-way pot. Yet that is often what happens when overly loose players will jump in the hand for $20 with any two suited cards. To combat this, we've been experimenting with opening a higher amount from early position to try to generate more isolation. Normally, we would open $20 from all positions. This table was not ridiculously loose, so $25 seemed a reasonable upsizing. However, some tables we have been at recently have needed an opening of $40 to generate a decent number of folds. It is an experiment in progress and we look forward to reporting the results on the podcast in future weeks. With $105 in the pot, the flop comes . The small blind checks. Hero checks behind. The first player in middle position checks, then Villain bets $40. The small blind folds. Hero calls. The middle position player folds, leaving just Hero and Villain. We've taught and spoken with players of all different skill levels, so we have a pretty good grasp of how players' thought processes evolve as they gain more experience. A beginning player with would look at this board and think, "I have an overpair. I'm ahead unless someone has trips or a boat. I'm going to bet." An intermediate player will say, "What will call me here that I have beat? There's not much except jacks, but with three other players in the hand, I'm sure one has a jack. I'm going to bet to get value from a jack." A more advanced player will say, "I can surely get value from a jack. However, how many streets of value can I get? Probably only two, maximum. Is there any danger to giving a free card here? Not really. I'm going to check to underrepresent my hand. If I do so, maybe I can even get two streets of value from a pocket pair under the jack." Do you see the difference in the more advanced line of thinking? It looks forward to future streets and sets out a game plan for those streets right from the flop. The key question is, "How many streets of value can I get?" If the answer to that question is not three, then we need to plan how to get maximum value on maximum streets from the maximum number of hands. To illustrate the point, let's give one of the opponents in position against us two hypothetical hands: and . Let's next assume that the turn and river run out two blanks. If we bet half-pot on the flop, the turn, and the river, at what point will each of these two hands fold? will likely fold the river and will likely fold the turn. Instead, let's say that we check the flop. It's likely that both of these hands will bet the flop for thin value and protection. After we call the flop, both will probably check back on the turn. If we then bet a reasonable size on the river, do you think both of these hands will make a bluff catching call? There's a decent chance. That means that we are gaining an additional street of value from a whole host of middling pocket pairs in this scenario if we check the flop. Of course, you only want to be doing something like this on a board as bone dry as . On a wetter board, not only do you want to avoid giving free cards to draws, but you can also be assured you can get value from those draws on both the flop and turn. Taken together, these two factors form the concept known as "immediacy of value." In essence, it means nothing more than "striking while the iron is hot" with a value hand on wet boards. Now with $185 in the heads-up pot, the turn is the for a board of . Hero checks and Villain checks behind. We should highly suspect that Villain would keep betting with any jack since his kicker is now inconsequential. Therefore, Villain's range is almost exclusively pocket pairs under the jack. Still with a pot of $185, the river is the , making the final board is . Hero bets $150. Villain doesn't think too long before making the call. Hero tables his and Villain mucks his hand. Following our game plan, we put out a roughly 3/4-pot bet, hoping to induce our opponent into a bluff catching call. I can almost guarantee that Villain's thinking went something like, "Seriously? You checked the flop with a jack or better? No way. I call." Villain mucked his hand, but we know with certainty what he had — a small pocket pair. Let's look back and see what we gained by our flop check. If we had bet flop and turn, he almost certainly would have folded something like on the turn. By thinking ahead and checking the flop, we generated an additional $150 of value on the river. It is of such small pickups that a mighty bankroll is ultimately made. Having a "street map" and looking ahead to future streets can help a great deal when trying to maximize value in hands such as this one. If you are considering a flop value bet, look ahead and ask yourself how many streets of value you stand to get. If the answer is less than three, consider checking dry flops with stable value hands. By underrepresenting your holding, you may pick up additional value on the river from your opponents' mid-range hands.